ArchiteG's Blog | Books on ARE Exams and LEED Exams and more by ArchiteG, Inc.
Books on ARE Exams and LEED Exams and more by ArchiteG, Inc.
My new book, “Practice Management (PcM) ARE 5.0 Mock Exam (Architect Registration Examination)”, has been published! Many readers ask about this book. Your wait is over! A Practical Guide & Mock Exam for the ARE 5.0 Practice Management (PcM) Division! To become a licensed architect, you need to have a proper combination of education and/or experience, meet your Board of Architecture’s special requirements, and pass the ARE exams. This book provides an ARE 5.0 exam overview, suggested reference and resource links, exam prep and exam taking techniques, tips and guides, and a realistic and complete mock exam with solutions and explanations for the ARE 5.0 Practice Management (PcM) Division. This book includes eighty challenging questions of the same difficulty level and format as the real exam (multiple-choice, check-all-that-apply, fill-in-the-blank, hot spots, and drag-and-place), including two case studies. It will help you pass the PcM division of the ARE 5.0 and become a licensed architect! Can you study and pass the ARE 5.0 Practice Management (PcM) exam in 2 weeks? The answer is yes: If you study the right materials, you can pass with 2 weeks of prep. If you study our book, “Practice Management (PcM) ARE 5.0 Mock Exam (Architect Registration Examination),” you have an excellent chance of studying and passing the ARE 5.0 Practice Management (PcM) division in 2 weeks. We have added many tips and tricks that WILL help you pass the exam on your first try. Our goal is to take a very complicated subject and make it simple. “Practice Management (PcM) ARE 5.0 Mock Exam (Architect Registration Examination)” will save you time and money and help you pass the exam on the first try! ArchiteG®, Green Associate Exam Guide®, GA Study®, and GreenExamEducation® are registered trademarks owned by Gang Chen. ARE®, Architect Registration Examination® are registered trademarks owned by NCARB. Gang Chen holds a master’s degree from the School of Architecture, University of Southern California (USC), Los Angeles, and a bachelor’s degree from the School of Architecture, South China University of Technology. He has more than 20 years of professional experience. Many of the projects he was in charge of or participated in have been published extensively in Architecture, Architectural Record, The Los Angeles Times, The Orange County Register, and more. He has worked on a variety of unusual projects, including well-known, large-scale healthcare and hospitality projects with over one billion dollars in construction costs, award-winning school designs, highly-acclaimed urban design and streetscape projects, multifamily housing, high-end custom homes, and regional and neighborhood shopping centers. “This was a great resource supplement to my other study resources. I appreciated the mock exam questions the most, and the solutions offer an explanation as to why the answer is correct. I will definitely check out his other ARE exam resources! “I have read the book and found it to be a great study guide for myself. Mr. Gang Chen does such a great job of helping you get into the right frame of mind for the content of the exam. Mr. Chen breaks down the points on what should be studied and how to improve your chances of a pass with his knowledge and tips for the exam and practice vignettes. “Construction & Evaluation (CE) ARE 5.0 Mock Exam (Architect Registration Exam)”, has been published! A Practical Guide & Mock Exam for the ARE 5.0 Construction & Evaluation (CE) Division! NCARB launched ARE 5.0 on November 1, 2016. We always incorporate the latest information into our books. This book provides an ARE 5.0 exam overview, suggested reference and resource links, exam prep and exam taking techniques, tips and guides, and a realistic and complete mock exam with solutions and explanations for the ARE 5 Construction & Evaluation (CE) Division. This book includes 95 challenging questions of the same difficulty level and format as the real exam (multiple-choice, check-all-that-apply, fill-in-the-blank, hot spots, and drag-and-place), including a case study. It will help you pass the CE division of the ARE 5.0 and become a licensed architect! Can you study and pass the ARE 5.0 Construction & Evaluation (CE) in 2 weeks? If you study our book, “Construction & Evaluation (CE) ARE 5.0 Mock Exam (Architect Registration Exam),” you have an excellent chance of studying and passing the ARE 5.0 Construction & Evaluation (CE) in 2 weeks. We have added many tips and tricks that WILL help you pass the exam on your first try. Our goal is to take a very complicated subject and make it simple. “ Construction & Evaluation (CE) ARE 5.0 Mock Exam (Architect Registration Exam)” will save you time and money and help you pass the exam on the first try! My new book, “Project Management (PjM) ARE 5.0 Mock Exam (Architect Registration Examination)” has been published! A Practical Guide & Mock Exam for the ARE 5.0 Project Management (PjM) Division! This book provides an ARE 5.0 exam overview, suggested reference and resource links, exam prep and exam taking techniques, tips and guides, and a realistic and complete mock exam with solutions and explanations for the ARE 5 Project Management (PjM) Division. This book includes 95 challenging questions of the same difficulty level and format as the real exam (multiple-choice, check-all-that-apply, fill-in-the-blank, hot spots, and drag-and-place), including a case study. It will help you pass the PjM division of the ARE 5.0 and become a licensed architect! Can you study and pass the ARE 5.0 Project Management (PjM)exam in 2 weeks? If you study our book, “Project Management (PjM) ARE 5.0 Mock Exam (Architect Registration Exam),” you have an excellent chance of studying and passing the ARE 5.0 Project Management (PjM) division in 2 weeks. We have added many tips and tricks that WILL help you pass the exam on your first try. Our goal is to take a very complicated subject and make it simple. ” Project Management (PjM) ARE 5.0 Mock Exam (Architect Registration Exam)” will save you time and money and help you pass the exam on the first try! “Programming & Analysis (PA) ARE 5.0 Mock Exam (Architect Registration Exam)”, has been published! A Practical Guide & Mock Exam for the ARE 5.0 Programming & Analysis (PA) Division! This book provides an ARE 5.0 exam overview, suggested reference and resource links, exam prep and exam taking techniques, tips and guides, and a realistic and complete mock exam with solutions and explanations for the ARE 5 Programming & Analysis (PA) Division. This book includes 95 challenging questions of the same difficulty level and format as the real exam (multiple-choice, check-all-that-apply, fill-in-the-blank, hot spots, and drag-and-place), including a case study. It will help you pass the PA division of the ARE 5.0 and become a licensed architect! Can you study and pass the ARE 5.0 Programming & Analysis (PA) exam in 2 weeks? If you study our book, “Programming & Analysis (PA) ARE 5.0 Mock Exam (Architect Registration Exam),” you have an excellent chance of studying and passing the ARE 5.0 Programming & Analysis (PA) division in 2 weeks. We have added many tips and tricks that WILL help you pass the exam on your first try. Our goal is to take a very complicated subject and make it simple. ” Programming & Analysis (PA) ARE 5.0 Mock Exam (Architect Registration Exam)” will save you time and money and help you pass the exam on the first try! My book, “LEED v4 AP O+M Mock Exam”, has been published! Many of you ask us for the updated version for our LEED books. Your wait is over. “LEED v4 AP O+M Mock Exam” has been published! Pass the LEED AP O+M Exam, Get Your Building LEED Certified, Fight Global Warming, and Save Money! The USGBC released LEED v4 in GreenBuild International Conference and Expo in November, 2013. The GBCI started to include the new LEED v4 content for all LEED exams in June 2014. We have incorporated the new LEED v4 content in this book. LEED (Leadership in Energy and Environmental Design) is one of the most important trends in development and is revolutionizing the construction industry. It has gained tremendous momentum and has a profound impact on our environment. There is NO official GBCI book on the LEED AP O+M Exam. LEED v4 AP O+M Mock Exams fills in the blanks and demystifies LEED. The book includes 200 questions and simulates the real exam in every aspect, including scope, difficulty level, format, and number of questions in each LEED category. It includes questions, answers, and explanations. This book is small and easy to carry around. You can read it whenever you have spare minutes. It is an indispensable resource for ordinary people, developers, brokers, contractors, administrators, architects, landscape architects, engineers, interns, drafters, designers, and other design professionals. Check out FREE tips and info for all LEED Exams and ARE Exams at GeeForum.com, you can post your questions for other users’ review. “These are TOUGH sample tests. You need this book.! “I highly recommend this book! Gang Chen holds a master’s degree from the School of Architecture, University of Southern California (USC), Los Angeles, and a bachelor’s degree from the School of Architecture, South China University of Technology. He has more than 20 years of professional experience. Many of the projects he was in charge of or participated in have been published extensively in Architecture, Architectural Record, The Los Angeles Times, The Orange County Register, and more. He has worked on a variety of unusual projects, including well-known, large-scale healthcare and hospitality projects with over one billion dollars in construction costs, award-winning school designs, highly-acclaimed urban design and streetscape projects, multi-family housing, high-end custom homes, and regional and neighborhood shopping centers. Check out FREE tips on the easiest way to pass the LEED v4 AP O+M Exam and information for all LEED exams and ARE exams at GeeForum.com, you can post your questions for other users’ review. “LEED v4 AP ID+C Mock Exam” has been published! Many of you ask us for the updated version for our LEED books. Your wait is over. “LEED v4 AP ID+C Mock Exam” has been published! Pass the LEED AP ID+C Exam, Get Your Building LEED Certified, Fight Global Warming and Save Money! The USGBC released LEED v4 in GreenBuild International Conference and Expo in November 2013. The GBCI started to include the new LEED v4 content for all LEED exams in June 2014. We have incorporated the new LEED v4 content in this book. There is NO official GBCI book on the LEED AP ID+C Exam. LEED AP ID+C Mock Exams fills in the blanks and demystifies LEED. The book includes 200 questions and simulates the real exam in every aspect, including scope, difficulty level, format, and number of questions in each LEED category. It includes questions, answers, and explanations. This book is small and easy to carry around. You can read it whenever you have spare minutes. It is an indispensable resource for ordinary people, developers, brokers, contractors, administrators, architects, landscape architects, engineers, interns, drafters, designers, and other design professionals. Check out FREE tips on the easiest way to pass the LEED Green Associate Exam and information for all LEED exams and ARE exams at GeeForums.com, you can post your questions for other users’ review. “Project Development & Documentation (PDD) ARE 5.0 Mock Exam (Architect Registration Exam)” has been published! A Practical Guide & Mock Exam for the ARE 5.0 Project Development & Documentation (PDD) Division! This book provides an ARE 5.0 exam overview, suggested reference and resource links, exam prep and exam taking techniques, tips and guides, and a realistic and complete mock exam with solutions and explanations for the ARE 5 Project Development & Documentation (PDD) Division. This book includes 120 challenging questions of the same difficulty level and format as the real exam (multiple-choice, check-all-that-apply, fill-in-the-blank, hot spots, case studies, and drag-and-place), including a case study. It will help you pass the PDD division of the ARE 5.0 and become a licensed architect! Can you study and pass the ARE 5.0 Project Development & Documentation (PDD) in 2 weeks? If you study our book, “Project Development & Documentation (PDD) ARE 5.0 Mock Exam (Architect Registration Exam),” you have an excellent chance of studying and passing the ARE 5.0 Project Development & Documentation (PDD)in 2 weeks. We have added many tips and tricks that WILL help you pass the exam on your first try. Our goal is to take a very complicated subject and make it simple. “Project Development & Documentation (PDD) ARE 5.0 Mock Exam (Architect Registration Exam)” will save you time and money and help you pass the exam on the first try! ArchiteG , Green Associate Exam Guide , GA Study , and GreenExamEducation are registered trademarks owned by Gang Chen. ARE , Architect Registration Examination are registered trademarks owned by NCARB. “Project Planning & Design (PPD) ARE 5.0 Mock Exam” has been published! Many readers ask about our ARE 5.0 books. Your wait is over! A Practical Guide & Mock Exam for the ARE 5.0 Project Planning & Design (PPD) Division! This book provides an ARE 5.0 exam overview, suggested reference and resource links, exam prep and exam taking techniques, tips and guides, and a realistic and complete mock exam with solutions and explanations for the ARE 5 Project Planning & Design (PPD) Division. This book includes 120 challenging questions of the same difficulty level and format as the real exam (multiple-choice, check-all-that-apply, fill-in-the-blank, hot spots, case studies, and drag-and-place), including a case study. It will help you pass the PPD division of the ARE 5 and become a licensed architect! Can you study and pass the ARE 5.0 Project Planning & Design (PPD) Exam in 2 weeks? If you study our book, “Project Planning & Design (PPD) ARE 5.0 Mock Exam,” you have an excellent chance of studying and passing the ARE 5.0 Project Planning & Design (PPD) Exam in 2 weeks. We have added many tips and tricks that WILL help you pass the exam on your first try. Our goal is to take a very complicated subject and make it simple. “Project Planning & Design (PPD) ARE 5.0 Mock Exam” will save you time and money and help you pass the exam on the first try! Source: Gang Chen For Mayor 2016: For a Better Irvine! “LEED v4 BD&C EXAM GUIDE” has been published! Many of you ask us for the updated version for our LEED books. Your wait is over. “LEED v4 BD&C EXAM GUIDE” has been published! Pass the LEED AP BD&C Exam, Get Your Building LEED Certified, Fight Global Warming and Save Money! The USGBC released LEED v4 in GreenBuild International Conference and Expo in November, 2013. The GBCI started to include the new LEED v4 content for all LEED exams in late Spring 2014. We have incorporated the new LEED v4 content in this book. 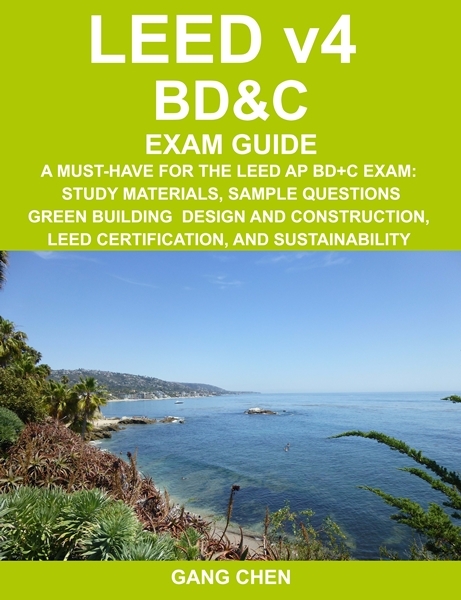 Starting on December 1, 2011, GBCI began to draw LEED AP BD+C Exam questions from Green Building and LEED Core Concepts Guide. We have also incorporated the latest information from this book. 1. Pass the LEED AP BD+C Exam. 2. Register and achieve LEED certification for a building. 3. Understand the intent of each LEED prerequisite and credit. 4. Calculate points for LEED credits. 5. Indentify the credit path, submittal requirements, synergies, possible strategies and technologies, project phase, LEED submittal phase, and responsible party for each prerequisite and credit. 7. Implement the related codes and standards. 8. Obtain points for categories not yet clearly defined by the USGBC. Most of the existing books on LEED and the LEED exams are too expensive and complicated to be practical or helpful. This guide fills in the blanks and demystifies LEED. It uncovers the secrets, codes, and jargon for LEED as well as the true meaning of “going green.” It provides a solid foundation and fundamental framework for LEED. It covers every major aspect of LEED in plain and concise language, and introduces it to ordinary people. This guide is easy to carry around. You can read it whenever you have a few extra minutes. It is an indispensable book for ordinary people, developers, brokers, contractors, administrators, architects, landscape architects, engineers, interns, drafters, designers, and other design professionals. Check out FREE tips on the easiest way to pass the LEED Green Associate Exam and information for all LEED exams and ARE exams at GeeForum.com, you can post your questions for other users’ review. “Great resource for studying for the LEED Exam! “Immensely valuable and utterly to the point, a true must have! – Second read the actual LEED BD+C guide to give you the background information on the credits and gain comprehension. Underline and review as the author indicates to get the most out of your study time.